Does it seem like you are always sick? Do you believe you are less resistant to illness than others? Are you worried when a friend has a cold you're sure to catch it? Have you given up on the possibility of perfect health? You were NOT singled out for sickness! You have a choice! Joel Fuhrman, M.D., a board-certified medical expert in disease prevention and reversal and host of the PBS special "The Immunity Solution," has written a complete guide to optimal health and ultimate wellness. Following years of scientific research and thousands of patient evaluations, Dr. Fuhrman penned his health masterpiece, Super Immunity. In it, readers are given step-by-step solutions on how they can teach their body's immune system to ward off everything from colds . . . to cancer. Just imagine supercharging your immune system to the point where it denies infection! The evidence is stunning! Nutritional scientists have made groundbreaking discoveries in recent years — and when this new research is implemented, the health results are extraordinary! 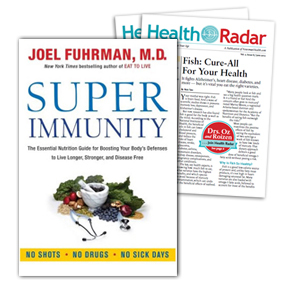 In Super Immunity, Dr. Fuhrman explains how you can use this new science to better your life. It all starts in the kitchen. What we feed our bodies has everything to do with our health, and sadly, most of us are making the wrong dietary choices. We are severely depleting immune function by consuming too many highly processed foods, added sweeteners, animal fats and protein. As a result we are shortening our lives, living sicker and spending way too much time at the doctor's office and hospital. We're also becoming much too dependent on prescription medications. Dr. Fuhrman says aggressive medical care is NOT the answer. He says the proven solution is to simply change our eating habits. The average American is nutrient deficient. We are not eating enough fruits, beans, seeds, and vegetables, and this deprives our bodies of the most vital immune-boosting compounds. "We have scientific evidence that the right raw materials and nutritional factors can double or triple the protective power of the immune system. It is possible to hardly ever get sick, and boosting your body's defenses to the level of Super Immunity can save your life." It's time to live sickness free! You'll find Health Radar jam-packed with easy-to-read and easy-to-apply help for your optimal health and wellness. Guest medical experts answer your questions about health issues that plague and frustrate you and your loved ones. Not only that but also, you'll read about nutrition, fitness, even healthy and delicious recipes to please the most picky palates. Eliminate your health worries . . .
Keep you out of the hospital — and your doctor's office . . . Protect you from unnecessary treatments, dangerous pills and procedures, and sky-high medical costs . . .
And add many years of robust health and vitality to your life and the lives of your loved ones . . . It's time to move beyond the limits of old-fashioned medicine. And move beyond those nagging health problems that make you feel old, sick, fat, weak, and stressed out. No matter what health issues you may be coping with, you'll discover every issue of Health Radar to be an outstanding source of useful action strategies that help you enjoy a fun-filled, active life. You'll find that this is truly news you can use to safeguard your health on a daily basis. IMPORTANT NOTE: Sales tax included where applicable. Your trial subscription comes with convenient automatic renewal. At the end of your subscription, we'll notify you. If you want to keep the publication, do nothing and we'll renew your subscription using your credit/debit card on file. We'll charge you $39.95 for one year (12 issues) of Health Radar and thereafter at the lowest rate then in effect. There is no risk, you can cancel within the first six months for a full refund of the unused portion of your subscription. In this book, readers are given step-by-step solutions on how they can teach their body’s immune system to ward off everything from colds . . . to cancer. You'll find Health Radar jam-packed with easy-to-read and easy-to-apply help for your optimal health and wellness. Guest medical experts answer your questions about health issues that plague and frustrate you and your loved ones.